Valkyrie Studios created this tutorial for round three of our TranspART competition. 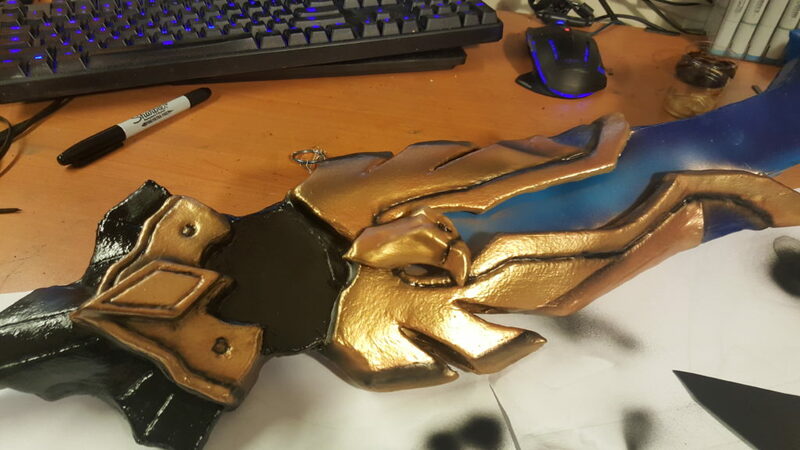 I crafted Felo’melorn for the third and final round of the TranspArt Competition put on by Worbla.com. For the final round we were able to build anything we liked using the materials sent to us, and then make a tutorial about our process. My entry for the previous round– The Sword of Fire and Ice– was surprisingly popular, and I received a lot of questions about how I made it. 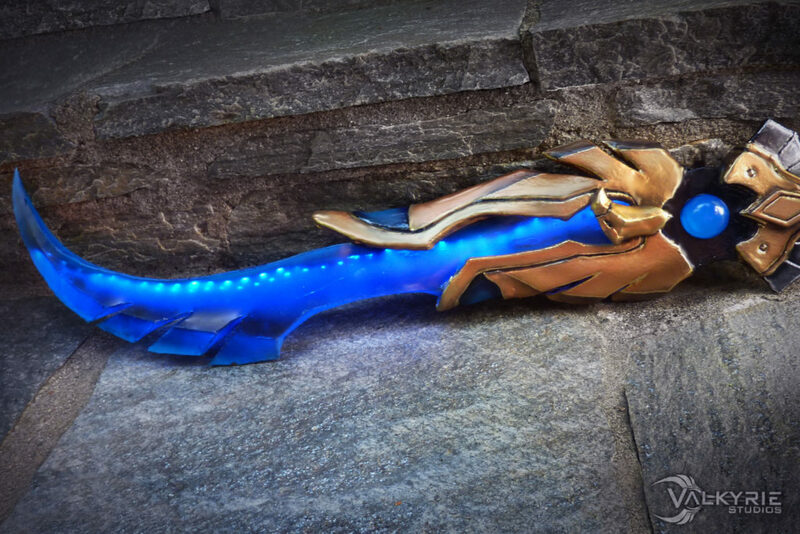 In particular, people were interested in the hollow blades, and how I made my project glow. Because of this I wanted to make a project in a similar vein. 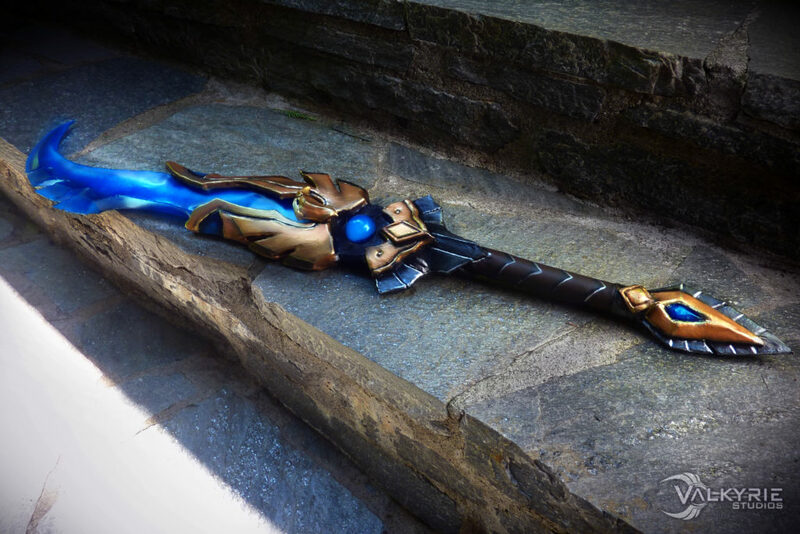 Since I’m very invested in Blizzard cosplay, and so many of their weapons have a glowy magical blades, I decided to go with something from the World of Warcraft Universe. 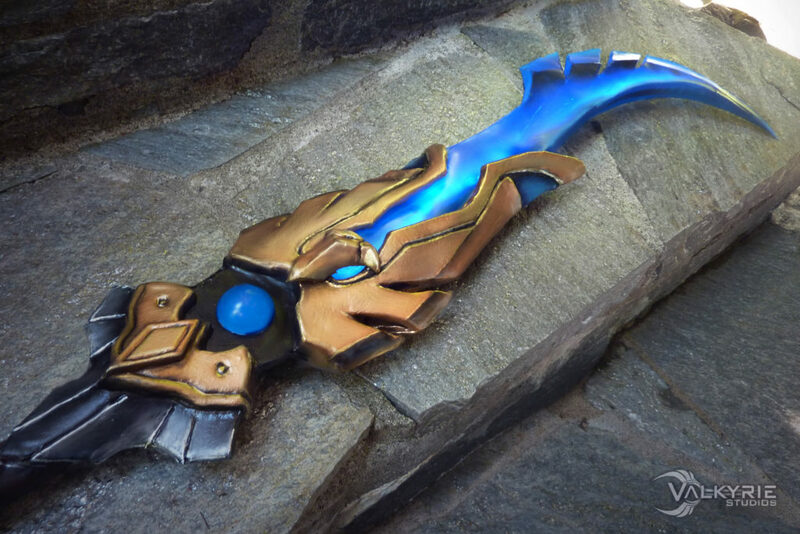 In honor of Legion — the new expansion that releases in August — I wanted to craft one of the new, super powerful, Artifact Weapons. I may not have a Mage in game, but I fell in love with Felo’melorn, Pride of the Sunstriders the minute I saw its design. 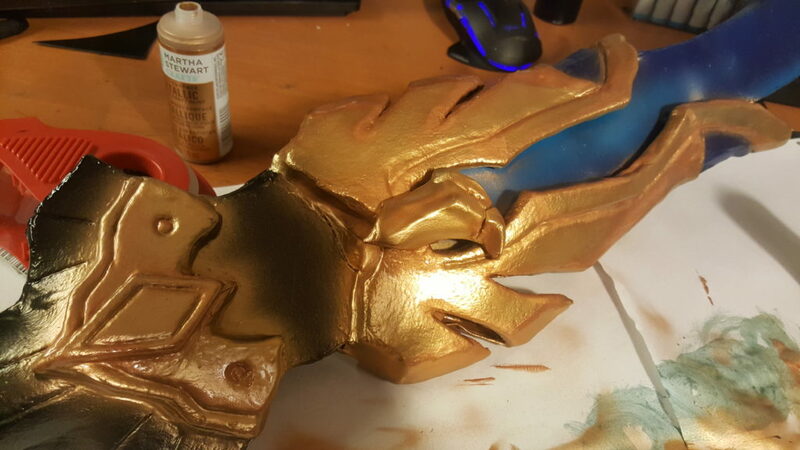 For my build I decided on the blue and gold version (since it comes in several colors). 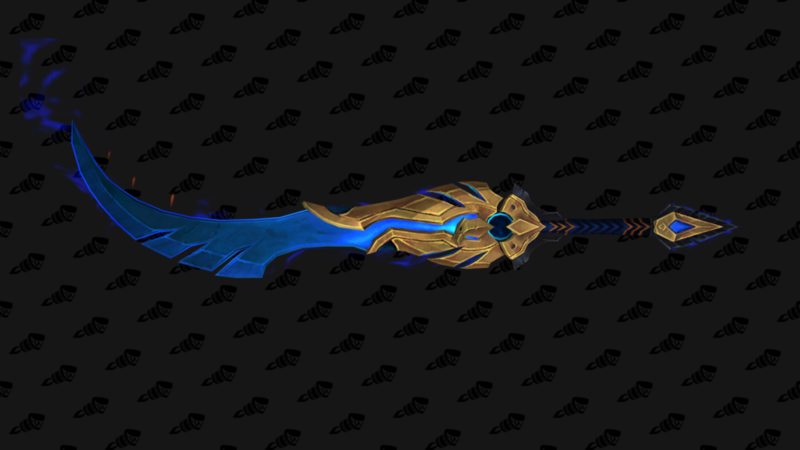 One of the really nice things about crafting things from World of Warcraft is that there’s a 3D model viewer for every item on Wowhead.com. This allowed me to get some nice screenshots of the sword from a few angles. I then took the screen shots into Adobe Illustrator to make vector blueprints (Inkscape is a free alternative). This allows me to scale it, and print it out as templates for my foam and transpArt shapes. I made a Free Blueprint of this project as a download in my store here! I made a video tutorial showcasing my method of making hollow TranspArt blades using a soldering iron to ‘weld’ the edges together. 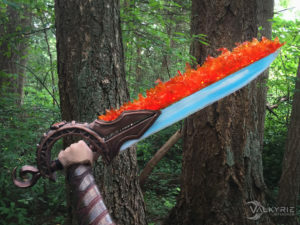 You can also fill these blades with resin, colorful fabric, or cover them in more TranspArt to look like fire; such as I did with my Sword of Fire and Ice. There are all sorts of possibilities, and super cool projects you can make with this method! Anyways I hope that a little of what I show here can help out. So this is the blade after it was heat welded together. I generally like to run my strip of Neopixels (programmable LEDs in a chain) down the spine of my blade so that it points down into the more interesting areas. Then I superglue it down so it doesn’t move around. This is my basic setup: an Adafruit 3V Pro Trinket (my arduino), and a JST switch that gets connected to my battery. 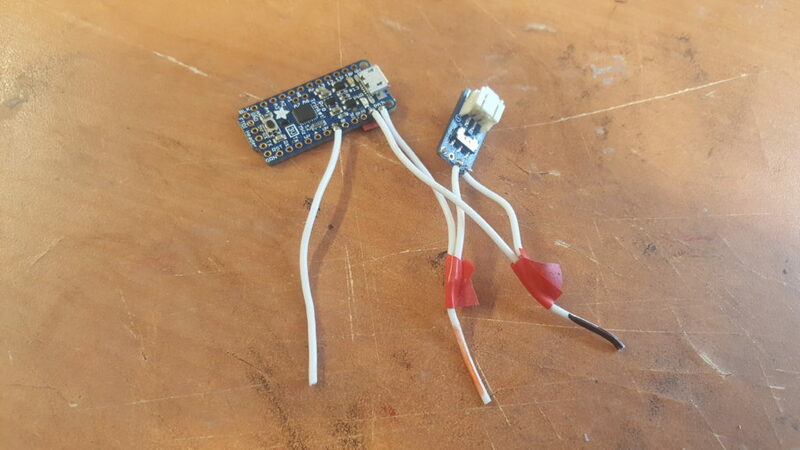 The switch input (+) from the JST switch goes into the 3V pin on the Pro Trinket as well as connects to the wire (colored red) that will get soldered the positive pad on your Neopixel Strip. The ground (-) from the JST switch goes into the G pin (ground) on the Pro Trinket as well as connects to the wire (colored black) that will get soldered the negative pad on the Neopixels. The third wire comes out of pin 6 on the Pro Trinket, and will be soldered into the Data In pad on the Neopixels. 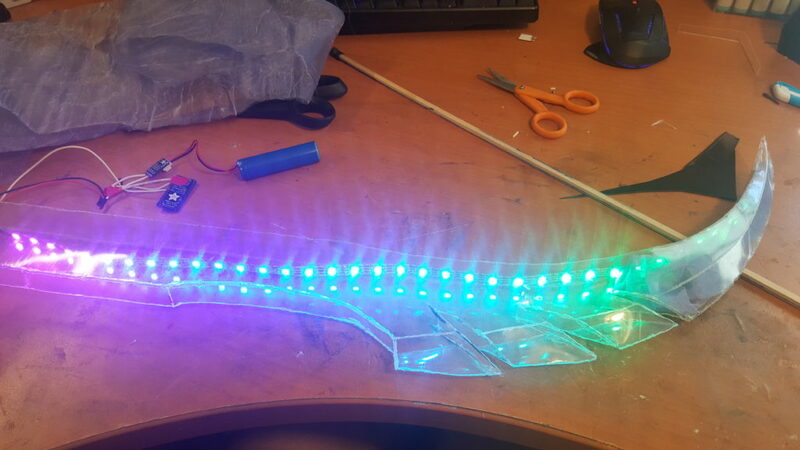 This is your Neopixel strip. You want to solder to the end that has the arrows going away from you because that is the direction of data flow. 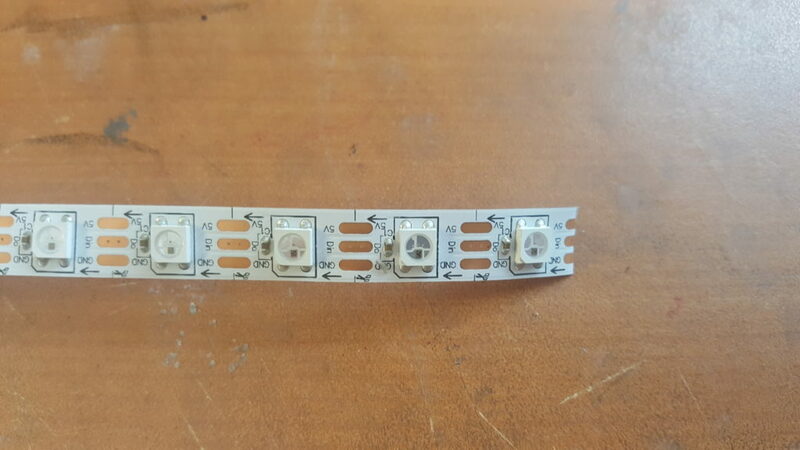 In this photo the top pad is 5V (+) — it works with 3V, but is dimmer. The middle pad is the Data In pad which carries the signal that tells your lights to do things. The bottom pad is Ground (-). This is what it looks like running the basic Strand Test that is available in the Adafruit Arduino IDE. I tried diffusing the light with some fabric, but it didn’t work as well as I wanted. The code I used in the final version of Felo’melorn can be found here. 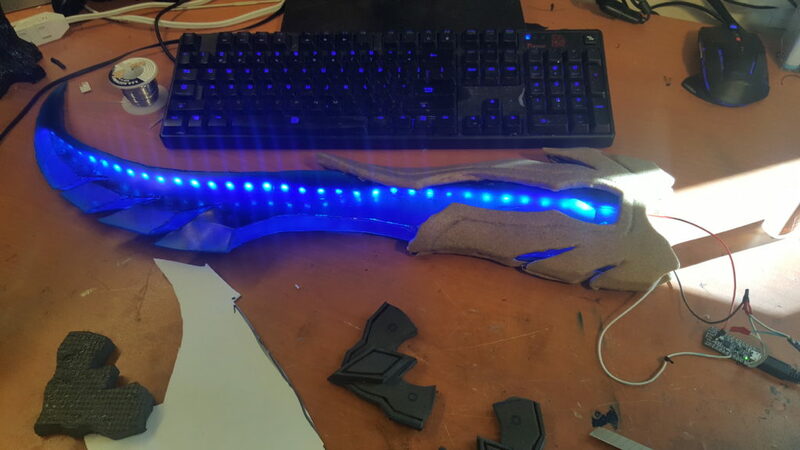 After I airbrushed the blade blue the LEDs diffused pretty nicely, so I was happy with how it turned out. The electronics and battery were hidden on the inside of the PVC handle, and the pommel pulls off so I can get at them. The final effect looks really good! Ok. 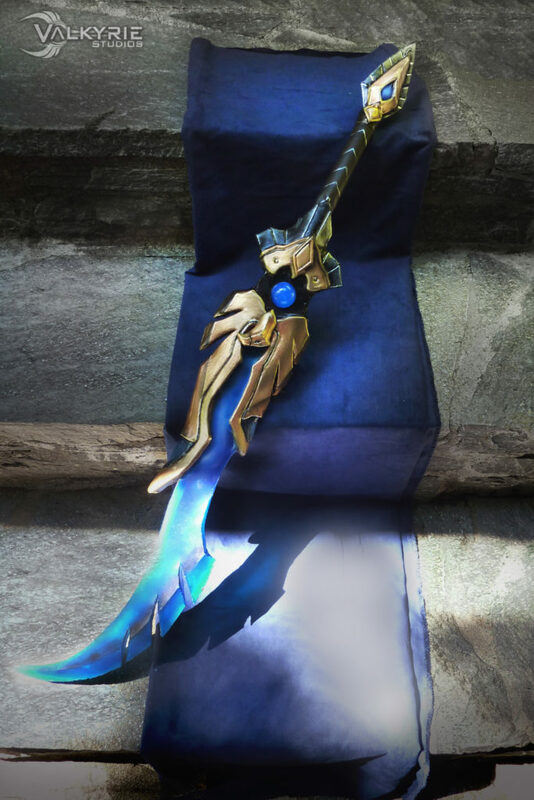 So now we have a glowy blade, now we have to make it into a sword. 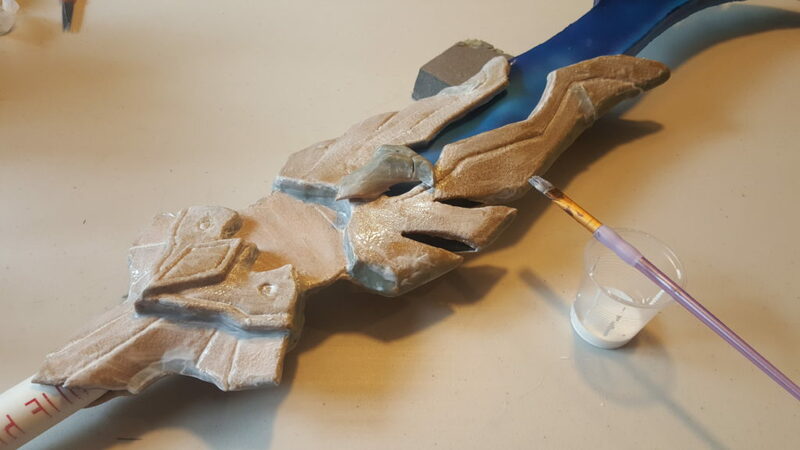 I used superglue and hot glue to stick each half to the blade. 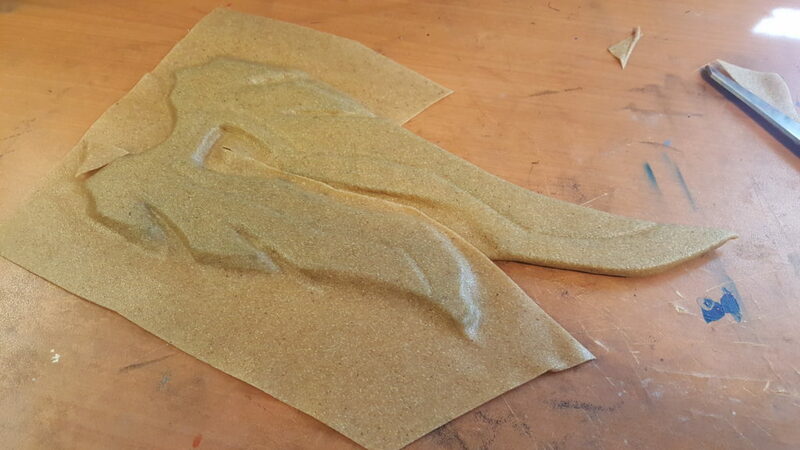 The worbla ‘wings’ were then heated up and squished together around the sides of the transpArt blade. The reference has the blade and handle float separately, but gravity doesn’t work that way in the real world unfortunately. 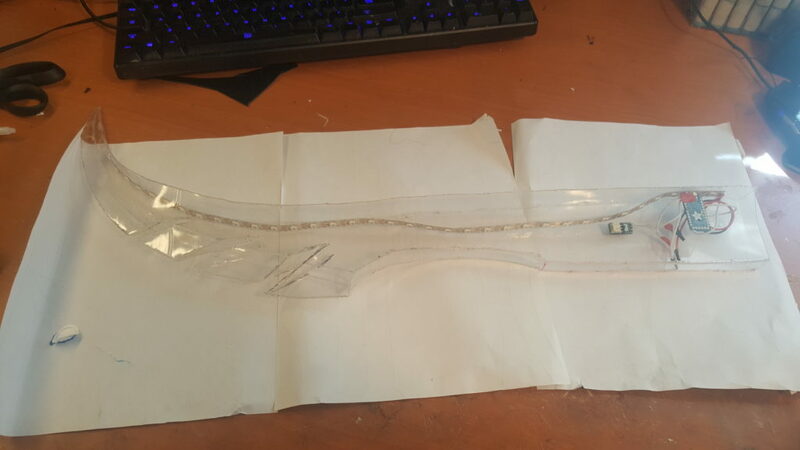 I tried making a clear piece out of transpArt to connect the two halves, but it wasn’t quite strong enough (and floppy blades are not what I’m after). 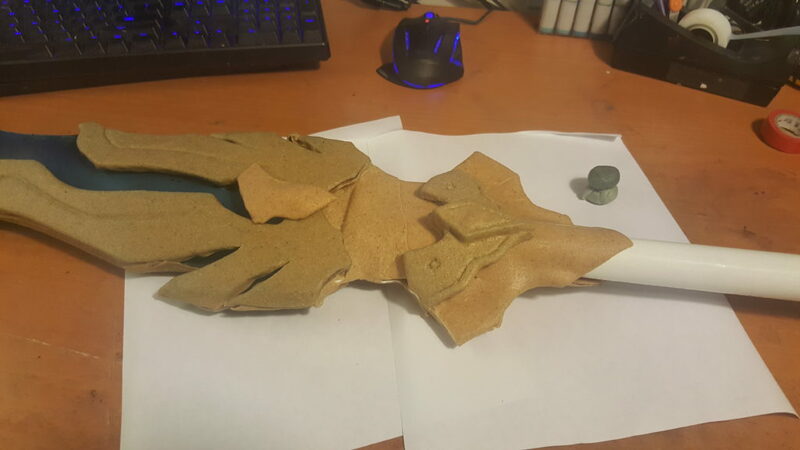 So I just used regular worbla. This also got wrapped around the PVC handle. 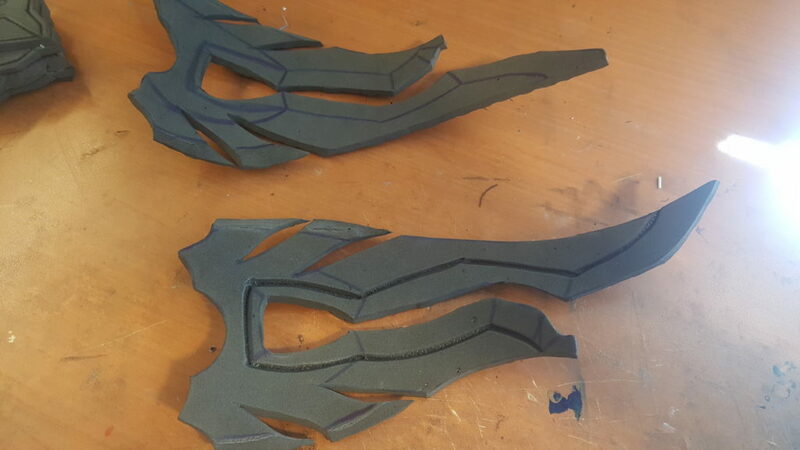 I made the decorative hilt the same way as the wings, using my soldering iron to burn designs into the foam. 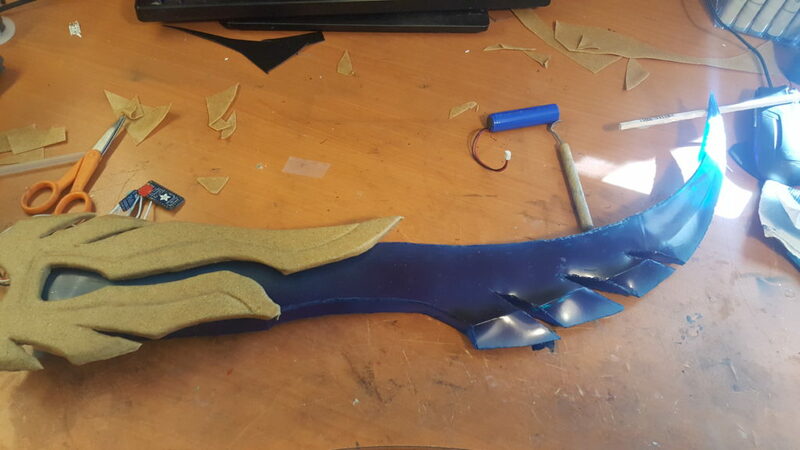 This also was wrapped in worbla, and I used a tool to press the lines back in. 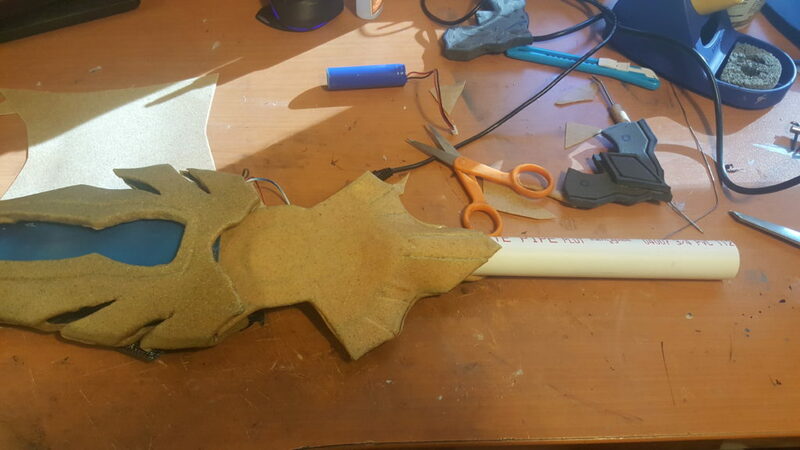 Here’s what it looked like all put together with the detail pieces, and the connecting piece is strong enough to hold the blade. I wasn’t entirely happy with the seams where the wings came together, so I mixed up some Apoxie Sculpt and smoothed them over. 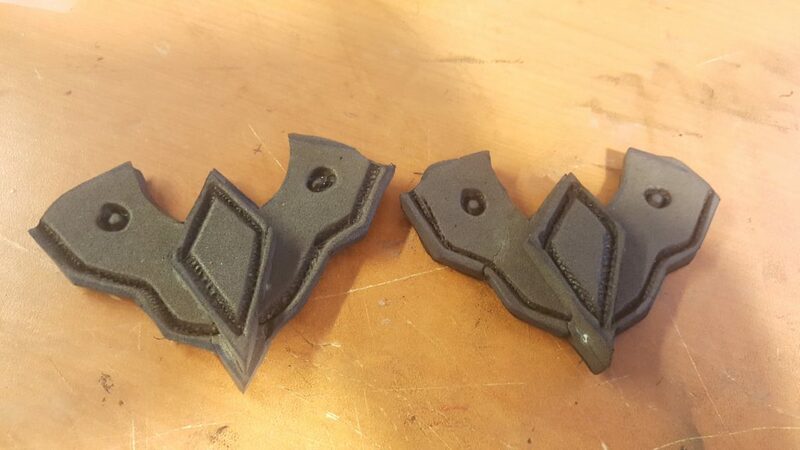 It’s an easy way to get a seamless effect without having to dremel the edges– which can get sort of messy. One of my favorite aspects of the design of this sword is the eagle wings that wrap around the blade. Using my blueprint I cut them out of EVA foam floor mat. I used my soldering iron (you can also use a hot knife) to burn in the decorative channel. 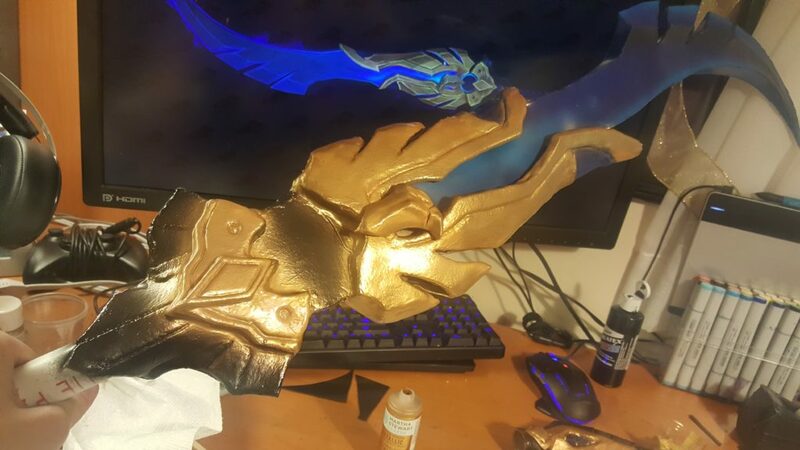 I then covered this with worbla, electing to use the fold-over method to save material since you woudn’t see the underside anyway. 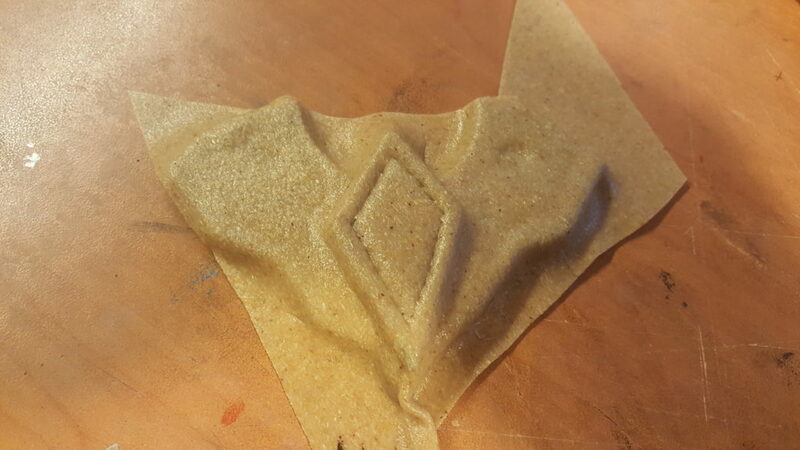 You can use sculpting tools to press designs into the worbla, but it works better if the foam already has indents to start with. Naked props never look as good as you want them to, but the paint job is what makes the magic come to life! 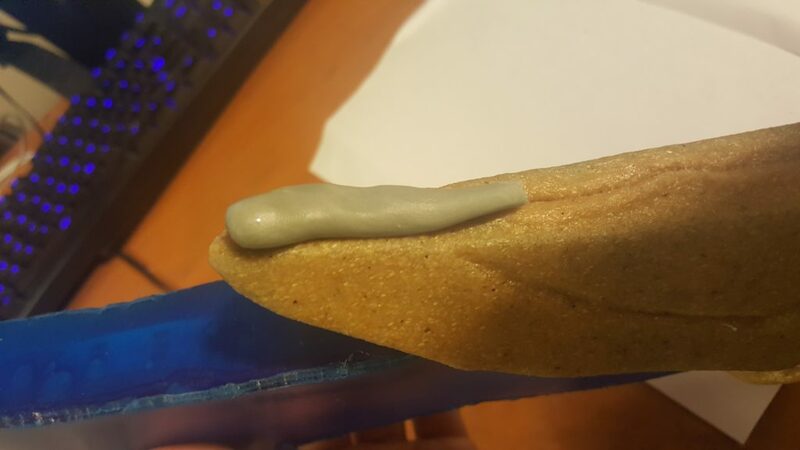 Normally I use 6+ coats of wood glue to seal my WFA projects, but since I had been given Flexbond, I decided to try that out instead since I heard it can make worbla smooth in two or three. 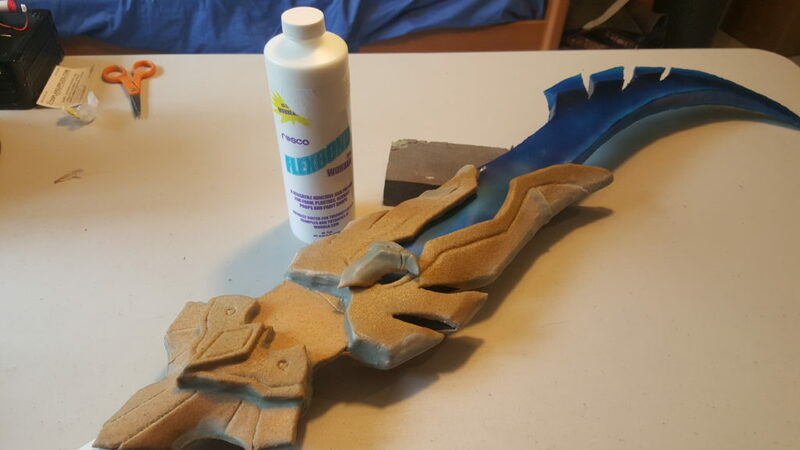 The Flexbond worked pretty well, but unlike wood glue, it isn’t self leveling, so brush strokes were evident even if you were being careful (which becomes an issue with metallic things, oops). I ended up using three coats, but I probably should have gone to four to make things extra smooth. 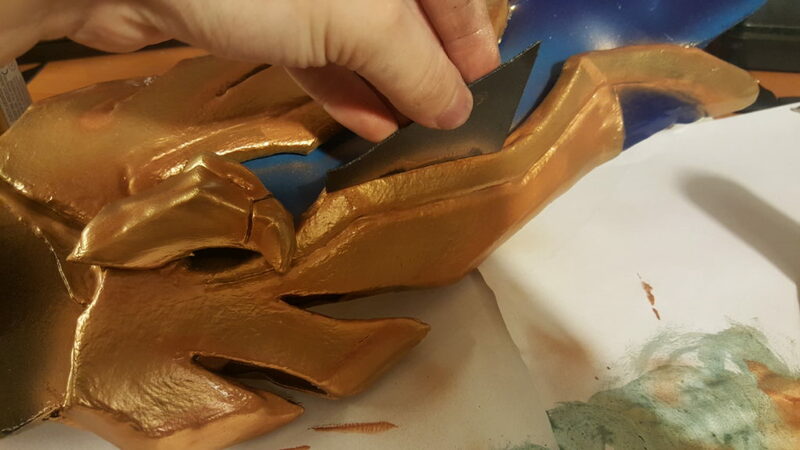 After everything had dried, I base-coated everything with either blue, black, or a yellow gold using my airbrush. From here I like to build up shadows and highlights. My next step was to add rose gold accents that would add depth– since yellow gold looks super fake and plastic-y by itself. 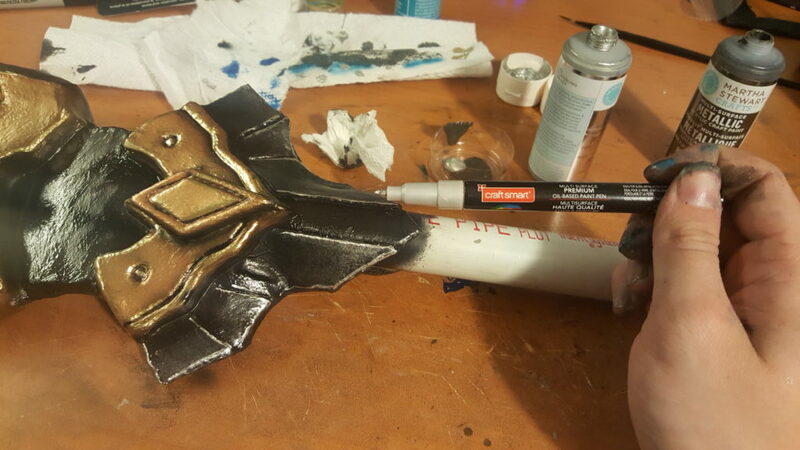 Since the blade was already painted and I didn’t want to get gold on it I like to use scraps of worbla or cardboard to prevent overspray. It’s faster than using masking tape, but I recommend that if you use this method you should be experienced with your airbrush. To add even more depth as well as some weathering, I mixed up an almost black burnt sienna color, and sprayed areas I wanted to have more shadow. I also applied this as a wash to the channels that I cut earlier with my soldering iron. 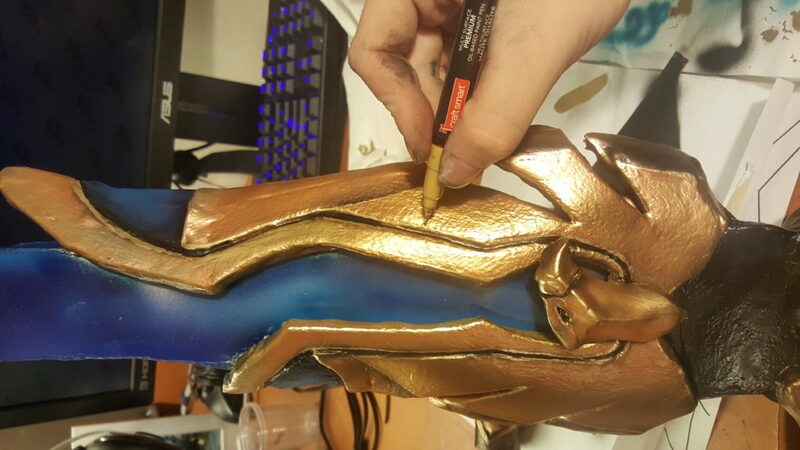 The final step is to hit the edges and raised areas with a gold paint pen. They can be fickle though, so be careful that it not spurt ink all over your project! 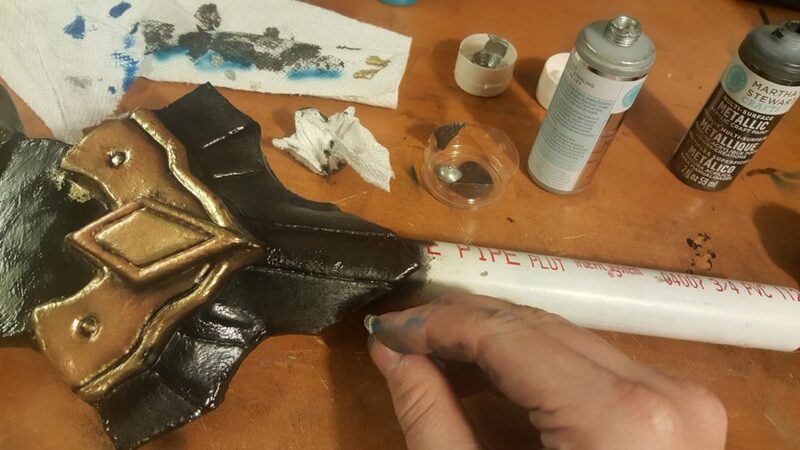 For silvery metals I like to sponge on gunmetal and aluminum colored paint using a paper towel or sponge to get a more steel-like appearance. As with the gold areas, I highlight the edges with a silver paint pen, to add some weathering, and also to make the details pop. The handle was wrapped with leather to hide the PVC pipe, and some details were painted on. And now you’re finished! 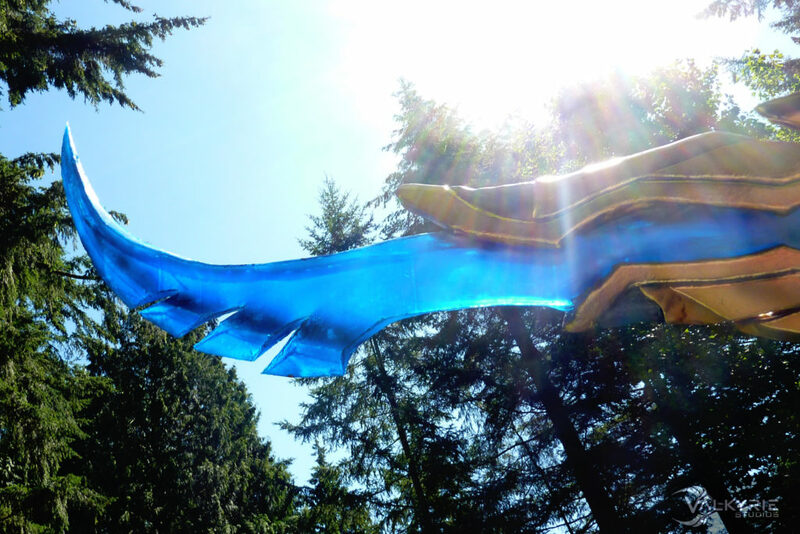 All in all, I’m very happy with how my project tuned out, and I hope you find this useful to make glowing or transparent blades for other projects!